While most families wait until the New Year – presumably after setting goals for the upcoming year – to get their finances in order, there’s no reason to waste precious months when you can get tackle them now! With a full two months remaining in 2012, there’s no better time to give yourself a full financial review and make sure you’re doing all you can to set your family (and your future) up for success in 2013. If you’re anything like me odds are that you relax on your budget from time-to-time. As the holidays approach and lives become hectic with fall activities, take a step back and analyze your spending patters over the last few months. If you’ve gone a little overboard with groceries or eating out, refocus your efforts and keep yourself accountable to your goals over the next few months. If you’ve yet to establish your first budget, whether individually or as a family, there is no better time than today to get started. Schedule a meeting with your wife to talk about where you’re at in life and where you want to go. There isn’t anything more important than communicating with your wife and establishing your first budget together. If you carry a credit card balance or have student loan, vehicle, or medical debt, then focus on coming up with a debt payoff strategy. Whether you follow the Dave Ramsey philosophy of paying debts down from smallest to largest, or prefer the mathematical approach of paying down the high-interest rate debt first, the only part that matters is that you develop a strategy of some sort. While some may prefer traditional debt payoff strategies, others may need to consider debt consolidation or analyze the chance to save hundreds of dollars in interest by transferring high-interest credit card balances to 0% balance transfer cards. Reviewing your various investment accounts and rebalancing your portfolio is a must. At a minimum this should be done on an annual basis and some suggest doing it quarterly. If you’ve never taken the time to determine how your investments should be allocated, then consider doing some research on the topic over the next few weeks or consult with a financial advisor and get some professional guidance. There isn’t a more common area where people “set it and forget it.” It’s too easy to get complacent and stay with the same insurance carrier for years; so, if you haven’t shopped your auto and home insurance rates in awhile then make it one of the first things you do. Odds are that you’re losing precious dollars (often hundreds) each year. As our society becomes more reliant on technology, more businesses are finding ways to offer services online. Along those lines we’ve seen a major shift in the way banking is being done these days. If you still hold your cash at the traditional brick-and-mortar banks and have been reluctant to change to some of the best online banks of 2012, then you’re likely not maximizing your debit card rewards (checking accounts) or interest rates on CDs and Savings Accounts. As many employers have open enrollment this time of year, make sure you thoroughly review and maximize all of the benefits they offer. Particularly, make sure you’re taking advantage of the FULL company match in your employer’s retirement plan. If you’re not sure how much your company matches, then make it a point to find out over the next few weeks. If you’re taking full advantage of your employer’s match, then focus on maximizing out a Roth IRA. While you technically have until tax day next year to make contributions for 2012, it’s not a bad thing to reach the $5,000 limit (if you’re under age 50; $6k if you’re over 50) before the year is out. A personal goal for my wife and I this quarter is to get a will. The majority of Americans die without a will and it’s due to nothing more than being lazy and lacking priorities. Visit a site like USLegalForms.com or contact a lawyer that will help you draft one. If you have valuables or children, then getting a will has to be something that you accomplish before the end of the year. While many people have taken advantage of the great interest rates, there are still a lot of people out there that haven’t. With rates at near all-time lows, it’s possible to replace your 30-year mortgage and get on a 20-year loan while keeping your payments the same. While I’ve given you plenty of goals to focus on over the next few months, it’s important that you get in the habit of making goals on a monthly and quarterly basis. Goals help to keep you focused and motivated as you work on getting out of debt or whether you’re building wealth and trying to knock some items off your bucket list. Author Bio: Jason is a financial advisor and Dave Ramsey-trained counselor that blogs over at WorkSaveLive. He aims to educate his readers on a variety of financial topics while sharing his family’s journey out of debt. Oh, the new year! It’s coming up so fast. Thanks for the much-needed reminder to reassess my year-end goals and look over my financial situation. It can always be tweaked and updated! I’m also really excited because this is the first year I’ve been able to max out my Roth IRA. All that hard work paying off debt is paying off and feels great! Awesome post Jason! Thanks Carrie! The end of year comes so quickly as we’re all busy with the holidays and buying presents for people. Hopefully this list will give a few some much-needed guidance as they prepare for 2013! What Carrie said! Just the thought of the New Year makes me pull my hair out. Great “end of year” list of tasks. Good luck, Matt! 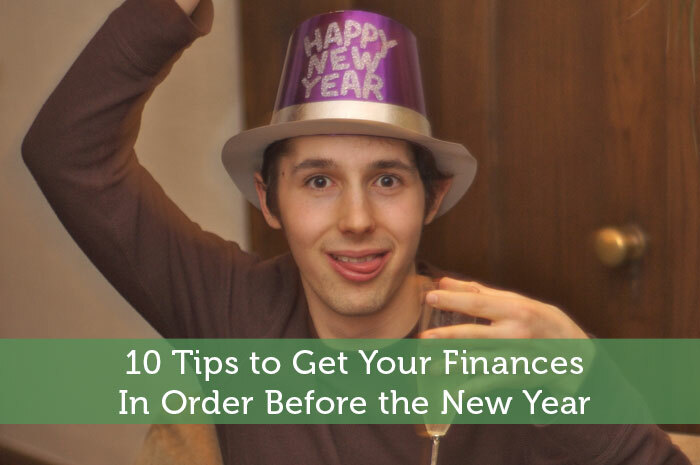 I think it’s so important for people not to ignore their finances until after the new year. Just like you said…most people wait until after they’ve messed everything up from the Christmas blowout! LOL. Having a baby is certainly the moment everybody should get a will (or update theirs). It doesn’t cost much so I’d encourage you to get that done and not delay the process! A lot of the items on your list are things that we need to look over! 2013 is coming so fast, I can’t believe it still. The end of the year can definitely creep up on us quite quickly. So for some of us we might need extra reminders to get to this stuff. No surprise here that Jason provides a quality list! I am excited that I can contribute even more to my Roth IRA next year but unfortunately that has to wait until 2013. This is just the list that everybody should go over each year…not sure I suggested anything ground breaking. Just a good reminder! 🙂 Glad you can focus on the Roth contributions next year! Take some of that blog income and sock it away in the Roth for this year! This is a great to do list – to be done now or any time. Even if seems overwhelming, you could break it down into a few tasks a month. I need to get going on the insurance thing – I never seem to get to it! Great point Cat! There is a lot to do in a short amount of time, so breaking it up over the course of a few months is a great idea. This is great! I think it’s a great idea to always reassess your situation with the new year. It’s a great time to see where you’ve been and where you want to be. For sure…if we’re going to be analyzing and planning anyway, we might as well dig into our full financial situation while we’re at it. This is great! One thing that my wife and I do every freaking year is look over our mortgage again. And one time we actually did end up saving ourselves some money! I guess I’ll soon have one more thing to check every year. I love the idea of doing an annual review, but I’m too undisciplined to do it that infrequently. We have monthly meetings and our budget is very detailed, so I’m quickly able to decipher where we’ve been messing up. For once, I am on top of almost all of these, with some thanks to great PF bloggers like yourself reminding me all the time! I do like my brick and mortar bank. I used to use Bank of America online because they did some sort of match with thier ” keep the change” program. Worst customer service ever! I do have an online savings account with ING, but like to be able to go by the bank if I need to. I do find some value in brick and mortar banks, but it’s not as much as I used to. I have a total of 3 bank accounts and 2 of them are online banks. We have 1 local bank we use, but it’s definitely not for the rewards or high interest rates. Roth IRAs do have a minimum income “floor” as well (I’m not sure if just Roth or Traditional as well), that students should be aware of. In 2008, I only made $7000 and saved “too much” in my Roth and had to pay a penalty at tax time. And I only put $400 in that year! Yikes! That’s a great warning Edward! Great tip, Joe; thanks for sharing that. I think a lot of employers have agreements with local gyms or cell phone carriers, but I’ve never heard of them having something setup with an insurance company as well. That’s definitely something I’ll have to keep in mind! Nice list Jason. I do most of it every year, and also like to look at the past year’s number and progress on net worth to keep motivated for the next year! I like the addition of looking at your net worth. It’s nice to have that kind of goal to push us to do better in the next year. Great list. For those who are self-employed I’d add starting a retirement plan beyond an IRA (or Roth IRA) is possible. I’m thinking in terms of a SEP or a Solo 401(k) if this fits their situation. Most major custodians such as Schwab, Fidelity, Vanguard, and TD make this easy to start and all offer a wide array of investment choices. Contribution limits are much higher than an IRA. Yep, people who are self employed may have a bit more to check over each year. Their retirement planning is sure to be one of those things since they won’t be getting any kind of company pension. Moving month is one month that it is incredibly tough to stick to your budget. Beyond the regular moving expenses, you end up having to restock food and replace all kinds of stuff. The best thing would to make a commitment that you are going to save atleast 15% of next year’s income. Next would be to stay true to your commitment. Saving 15% is a very aggressive goal but if you can do it then I’d encourage anybody to give it a try! Great post Jason! So many people forget about drafting a will, but it can have a profound impact on your loved ones should anything ever happen to you. Yes when you have people dependent on you, that’s not something you should ever neglect. I don’t have to worry about that yet, but maybe in the not so distant future. I love reading this article. Everyone should be educated in basic personal financing. I am lucky to have parents who taught me budgeting at an early age. I definitely agree that the first step in putting your finances in the right order is to budget what you earn. Another thing to consider is to eliminate debts. I think the issue on debts has been around, since people went over their planned budgets. It’s a true blessing to have parents that raised you around the understanding of living on a budget. In my household, there was never a mention of financial topics such as budgeting, investing, or managing debt wisely. It definitely put a strain on my finances and left me in the dark when I tried to live in the “real world” on my own! And if you’re an entrepreneur or business owner, review ALL the systems and tools you currently have in place that keep your business alive, take out what’s not being affective and replace it with other business generating and growing ideas, and then finish this year strong to better set yourself up for your best year ever in 2013! Great tip, Lou! I didn’t address the business side of things much here but you’re right on. I actually am going through this process with my website and thinking of how I want to structure things for 2013. It’s pretty exciting when you plan and work on development, regardless of whether it’s on your personal budget or on the business side of things! These are some great tips Jason. I have been doing some of these so far, but since my first born is due near Christmas, I have been taking a more fine tip comb approach to my finances and my investments. I also have to push my attention toward a will. This year is soon going to be over, so these tips should be good for anyone. Great post Jason. My husband and I, now that we’re married, definitely need to get a will done before year end so thanks for the reminder! Yup when your life changes like that, stuff like your will definitely needs updating. You want to look after each other if anything happens. Your tips are awesome. It is really important to create and review your budget to keep your finances in order for the coming year. Next to this is to know how to pay off your debts. This is all a matter of having a sound financial sense. A budget should probably be reviewed more than once a year, but a new year is a good reminder to check that again. These are great tips not only for the New Year, but all year long. It would be nice to check all of this stuff throughout the year, but the fact of the matter is that most of us lead very busy lives. So it’s not always practical to keep spending time on this stuff. Checking once a year should be the minimum though. It might sound crazy but cancel your current cell phone plan and go to an MVNO. I switched from Verizon to Ting and my cell phone bill dropped from $145 to $22 per month for two lines. Complete control and usage based pricing. I’m on Wifi all the time so I don’t need to pay for data. Ridiculous savings. That is a huge savings, but canceling a cell phone plan is usually quite pricey itself. It’s something to look into if you find yourself spending a lot on your cell phone though.